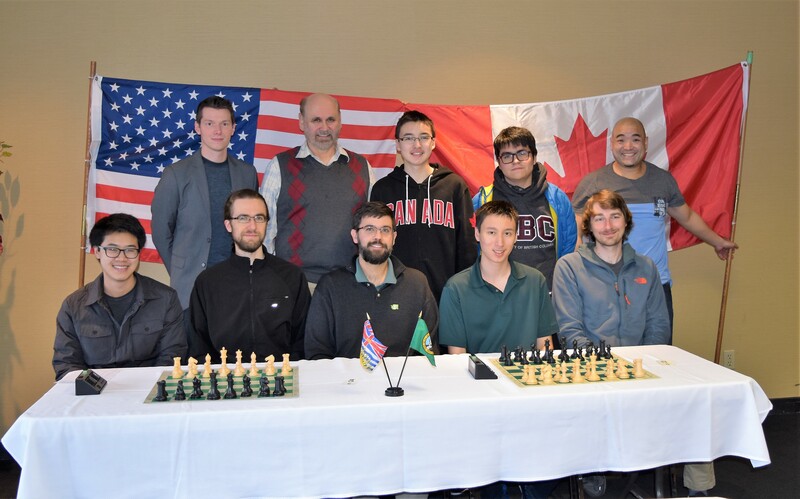 A Teams: Back row: Tim Moroney(WA), organizer Paul Leblanc, Joshua Doknjas(BC), Javier Cortes(BC), a Chilean chess master attending UBC, Howard Wu(BC). BC Masters 12.5 – WA Masters 12.5 Tied Match! BC Team #2 9.0 – WA Team #2 16.0! Each team was comprised of five players, each of whom played one game against each member of the opposing team. 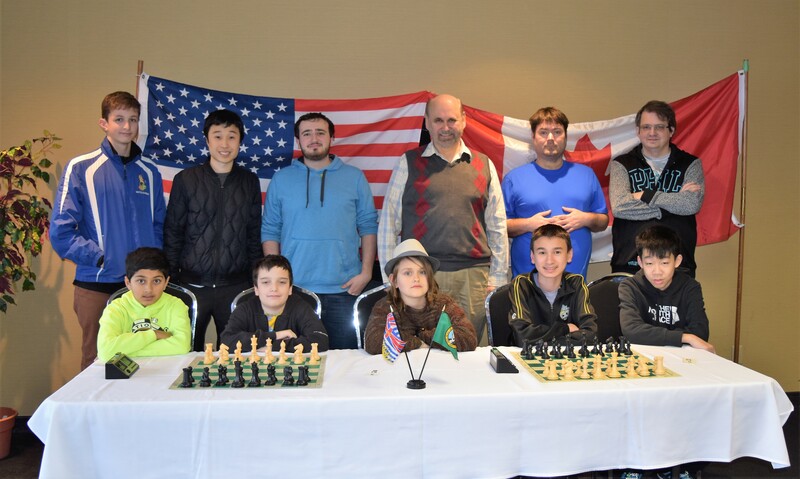 The event was sponsored by Victoria Chess, the BCCF, the Washington Chess Federation, the Victoria Chess Club, Thrifty’s groceries, Designer Chess and several of the players. B Teams: Top row: Oscar Petrov(WA), Sloan Setiadikurnia(WA), Jacob Mayer(WA), organizer Paul Leblanc, Jamie Campbell(BC), Jason Williamson(BC). Bottom Row: Advaith Vijayakumar(WA), Daniel Shubin(WA), Rowan James(BC), Neil Doknjas(BC), Michael Su(BC). 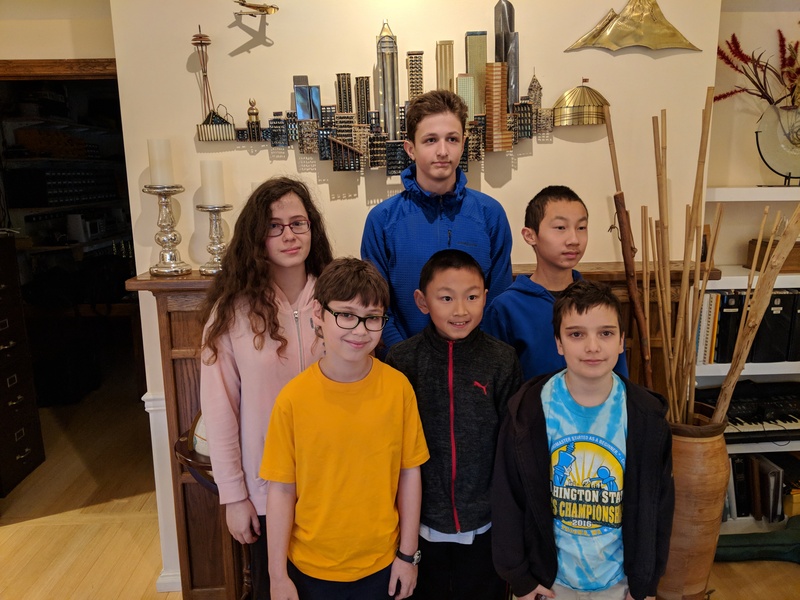 Back Row, L to R: Naomi Bashkansky, Oscar Petrov, Anthony He Front Row, L to R: Joseph Levine, Eric Zhang, Daniel Shubin. Photo credit: David Hendricks, TD. Congratulations to Anthony He for winning the WA Junior Closed Jan 5-7 with a perfect 5.0 score. Naomi Bashkansky placed 2nd, and there was a tie between Oscar Petrov and Daniel Shubin for 3rd place. This was the youngest field we have had in a long time with one high schooler, 4 middle schoolers, and 1 elementary aged player. The US Chess Rating Report can be found here. Playing room at the WA Winter Classic. FM Steven Breckenridge of Gresham, OR, won the the 2017 WA Winter Chess Classic with 7/9 and took home the $500 first place prize! Steven finished half a point ahead of second place finishers FMs Anthony He and Ignacio Perez, each of whom won $325 for their efforts. Davey Jones of Seattle won the 19-player Challengers section with 6.5 points and won $300. Half a point behind him were two players who tied for second and third place: Dan Mathews and Stephanie Velea, each of whom took home $200. 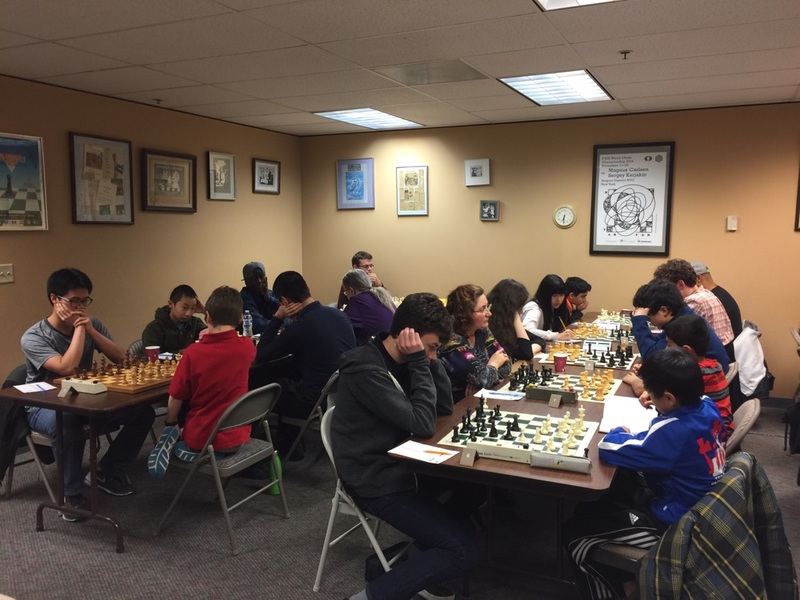 The WA Winter Classic was directed by Fred Kleist, hosted by Seattle Chess Club, and organized by WCF Tournament Coordinator Dan Mathews. The US Chess crosstable can be found here. Photos from the tournament can be viewed on the WCF Facebook Page.